At last, a warm, sunny day! 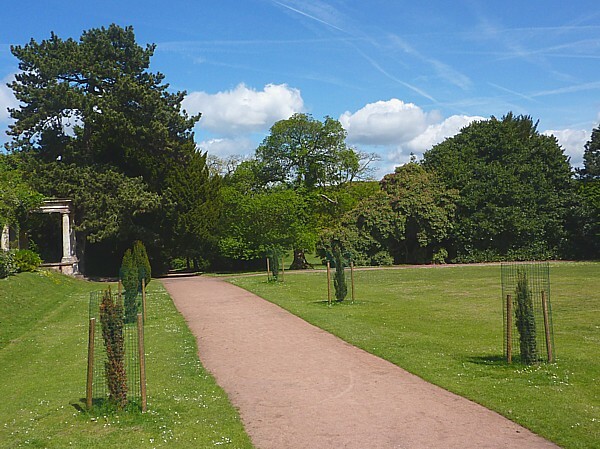 We took the 80A bus from Great Charlotte Street to Allerton Road and walked to the park via Allerton Church. 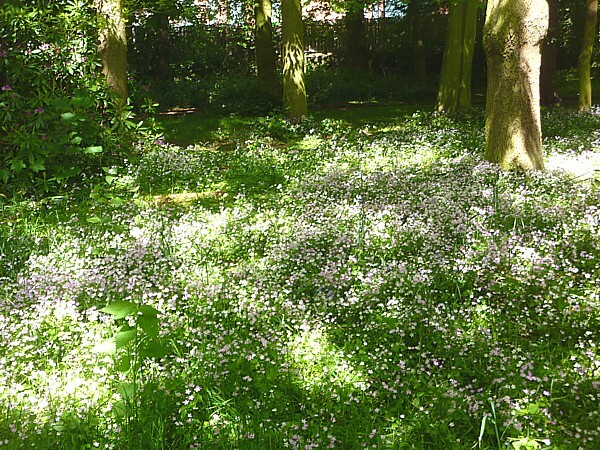 Just inside the park gate near Ballantrae Road there was a carpet of flowers under the trees, which we took at first for Bluebells “gone over”, but when we looked more closely we saw it was a mass of Pink Purslane. I have never seen so much. 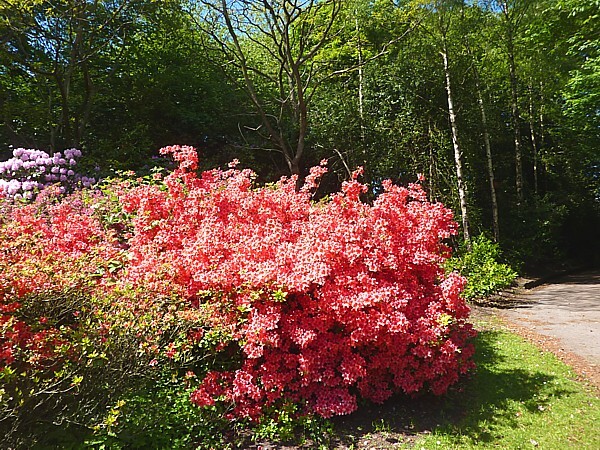 All the Azaleas and Rhododendrons were making a great display. 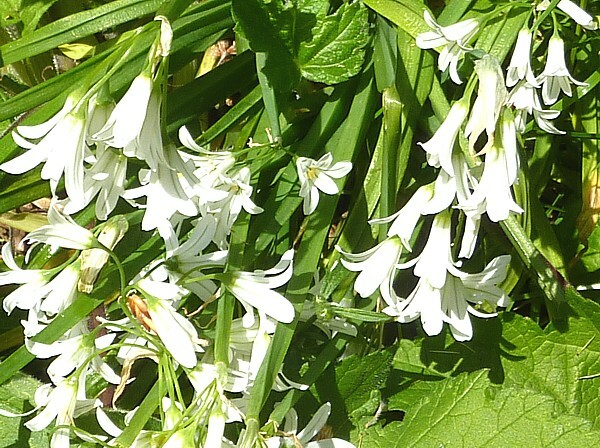 In a less “gardened” corner, Wild Garlic was still in bloom, big Coltsfoot leaves carpeted the shade and there was a cluster of Three-cornered Leek. The stems really are triangular! 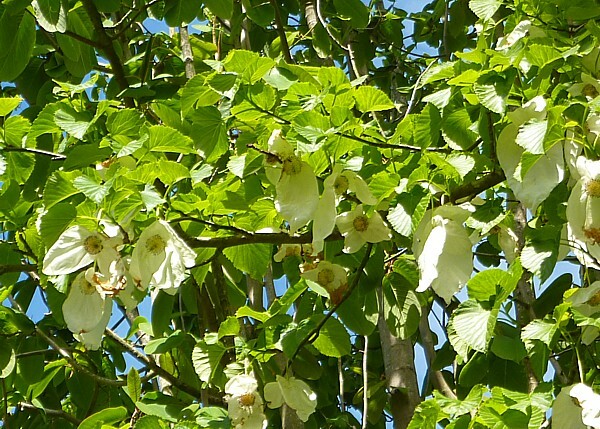 We were delighted to find a Davidia (Handkerchief Tree) in flower. The pairs of large white bracts around each flower hang in rows, festooning the tree with dainty “pocket handkerchiefs.” It’s another of the species discovered in China by French missionary Père (Father) Armand David, who also named Buddleia (Buddleia davidii) and Père David’s deer. There were lots of last year’s big nuts lying around. I have tried to plant them in the past, even “scarifying” them in the fridge for a time, but none have ever germinated for me. 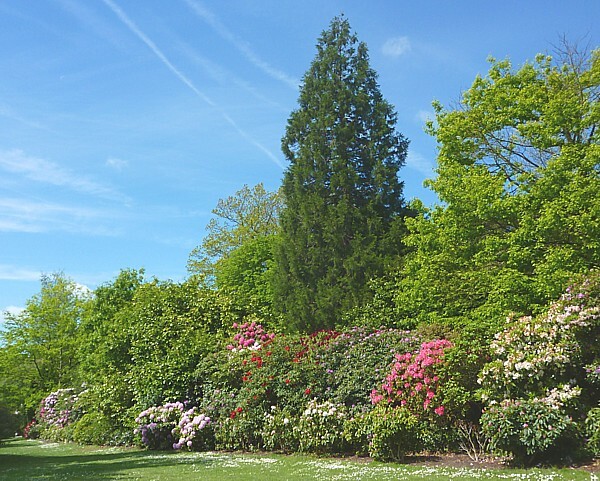 In the shrubbery was a tall Giant Redwood (Wellingtonia), with its lower branches curving down and brushing the ground. We searched its soft bark for the depressions made by roosting Treecreepers, but although there is a good population of Treecreepers in the park, they don’t seem to roost on this one. We lunched in the ornamental gardens. 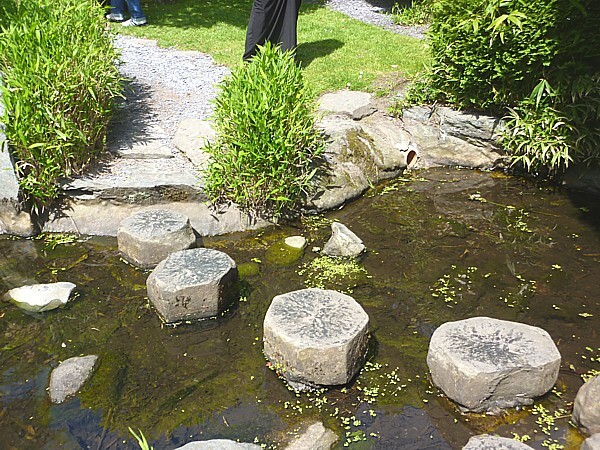 Olive has been told by Richie the (ex-) Ranger that the hexagonal stepping stones over the little stream in the Japanese garden are cut from a basalt column from the Giant’s Causeway in Ireland. 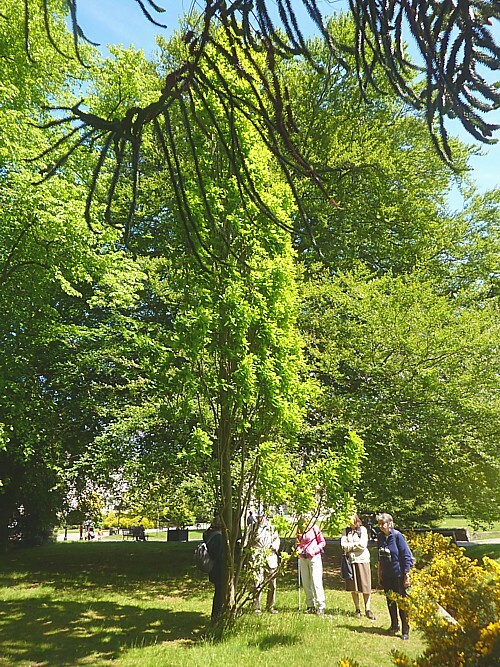 Near the children’s playground, which was given in memory of Linda McCartney, ex-Beatle Paul planted a tree a few years ago. 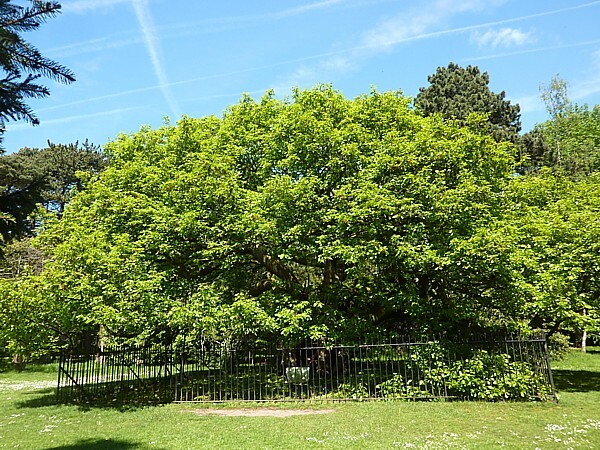 It’s an Upright Oak, variant “Fastigiata Koster”. Talking of oaks, we visited the famous Allerton Oak, known to be about 1000 years old and now fenced off and propped up. The trunk is hollow but the tree is still vigorous, producing plentiful leaves and acorns in season. A pair of Nuthatches seem to be nesting there, and they were popping about all over the branches, hunting for insects. They appeared to be quite relaxed behind their fence. A pair of Speckled Woods danced around us, intent on their courtship and oblivious to anyone standing in their way. Then we crossed the golf course, passed the ruin of Allerton Manor House and its obelisk, and came into Allerton Tower Park. Five of the burnt Irish Yews outside the orangery have been replaced with new young trees, so just one of the original damaged six remains, the furthest on the left. 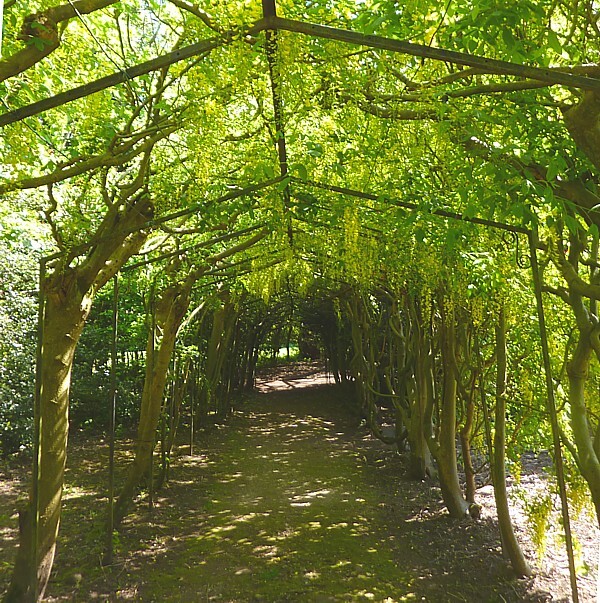 In the walled garden the Wisteria was in bloom but the Laburnum arch wasn’t a success, with most of the flowers on the outside, in the sun. 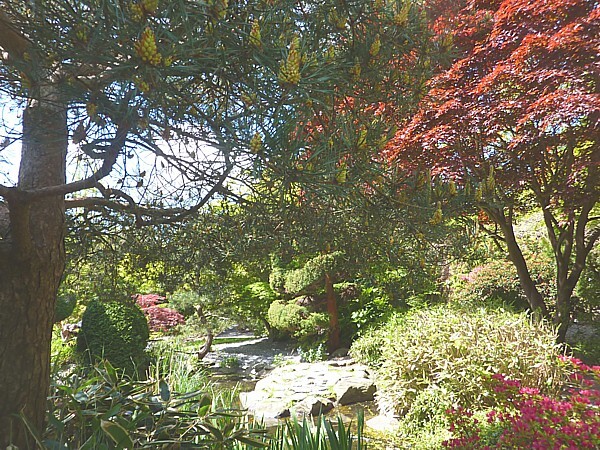 Definitely not up to the standard of Ness or Bodnant Gardens. 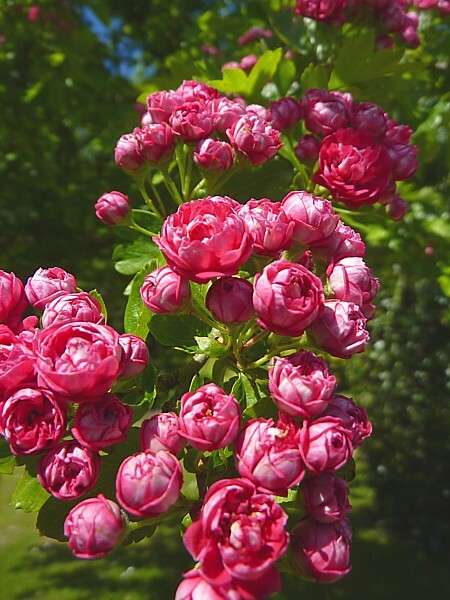 The ornamental pink Hawthorn along the Holly and Yew walk was some compensation. Then to Olive’s for her traditional strawberry scones. Thanks Olive!